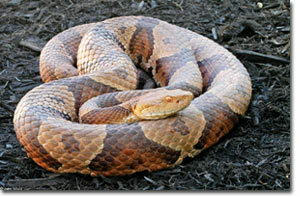 There are many different kinds of snakes in Indiana, but only timber rattlesnakes (Crotalus horridus), Eastern Massasauga rattlesnakes (Sistrurus catenatus), northern copperheads (Agkistrodon contortrix), and western cottonmouths (Agkistrodon piscivorus) are venomous and should be avoided. Snakes are very specialized animals and have an important role in our environment. Most snakes are non-venomous and help control rodent and insect populations. Like other reptiles, snakes are cold-blooded animals; their body temperature is regulated by climatic conditions. Snakes cannot tolerate extreme cold and will normally hibernate during the winter months, usually emerging from their dens in March. Snakes are most active at night and during early morning and late evening hours. Most non-venomous snakes cause little damage other than to frighten people. 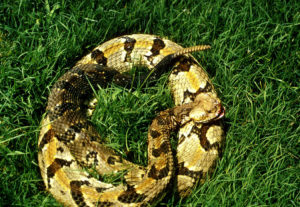 Occasionally, large snakes may feed on chicks, small ducks or eggs. In some cases, water snakes may damage fish farms by feeding on fish. The greatest danger to people is the possibility of being bitten by a venomous snake. 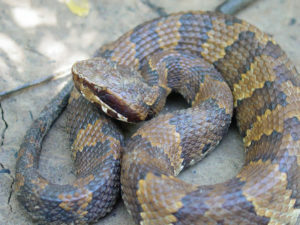 The best way to prevent snake bites is to learn how to recognize the venomous ones, and keep away from rocky or brushy areas where they are likely to be found. . 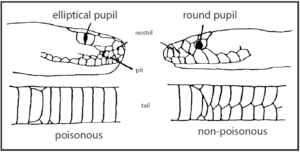 Pit vipers have elliptical pupils. 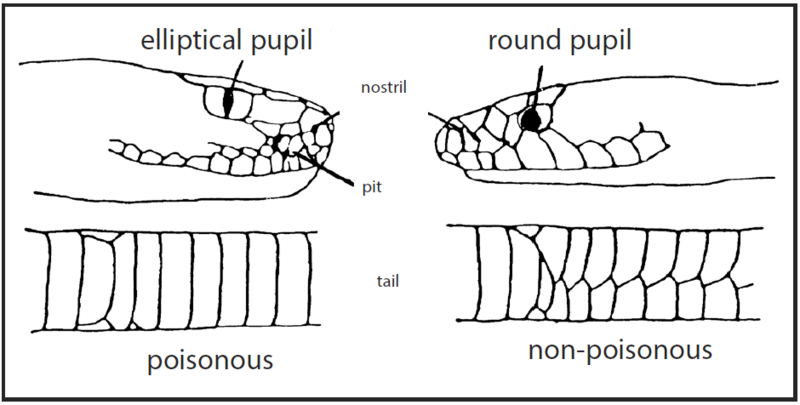 Non-venomous snakes have round pupils. Pit vipers have a loreal pit located between the eye and the nostril. Non-venomous snakes do not have this pit. Pit vipers have one row of scales on the tail undersurface between the vent and the tip of the tail. Non-venomous snakes have two rows of scales. If the presence of snakes is undesirable, removing their shelter is one of the most effective ways of discouraging them. Eliminating rock piles, brush piles, tall grass, etc., will cause snakes to seek a more suitable habitat. Lumber, wood piles and other debris around the home should be stored at least 18 inches off the ground. Controlling insect and rodent populations in the area also will help to discourage snakes by eliminating their food supply. Fig. 2. A snake-proof fence can be constructed from 1 /4-inch hardware cloth, 36 inches wide, with the bottom edge buried at least 6 inches in the ground. 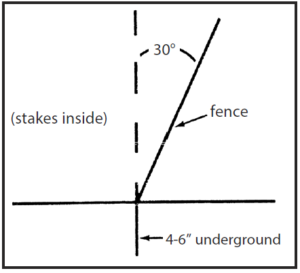 For best results, the fence should be slanted outward at a 30-degree angle. Sometimes snakes enter houses, barns and other buildings. They are attracted by the presence of rodents or insects as well as by the cool, damp, dark areas of buildings. To keep snakes out of houses or other buildings, all points of entry must be sealed. Since snakes normally enter a building at or below ground level, all openings around water pipes, electrical outlets, doors and windows should be closed. Holes in masonry foundations around the home should be sealed with mortar. Hardware cloth or sheet metal also can be used to seal holes in wooden buildings or siding. Snake-proof fences may be of some value if the area to be protected is relatively small. The fence should be made with heavy, galvanized screen with 1/4-inch wire mesh. The fence should be 36 inches wide, with the lower edge buried at least 6 inches in the ground. 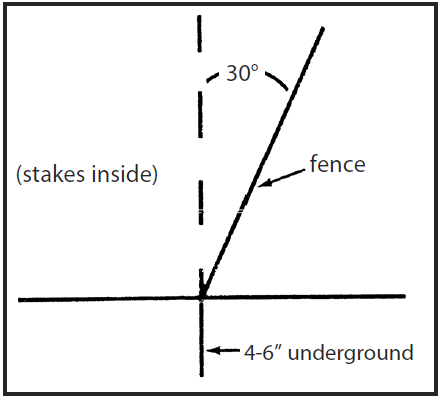 Slant the fence outward from the base at a 30-degree angle using supporting stakes inside the fence (Fig. 2). Tall vegetation around the fence should be cut to prevent snakes from climbing over the fence. Since the construction of a snake-proof fence may be costly, this method is normally practical only in small areas. Fig. 3. 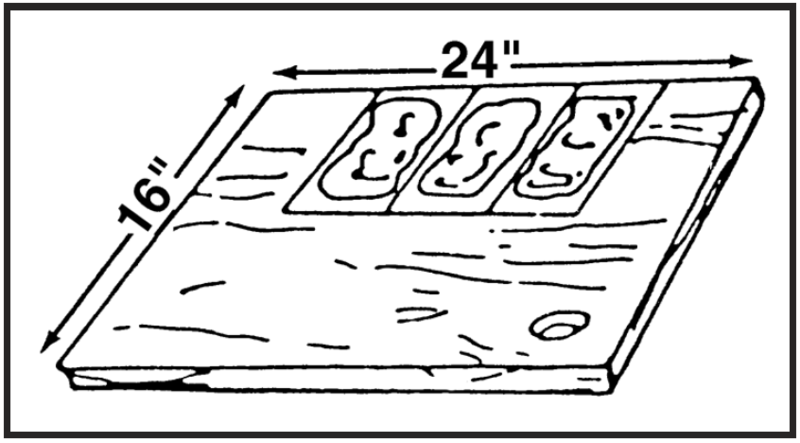 A glue trap to catch snakes can be made by attaching several rodent glue traps to a wooden board. The trap can then be placed along the walls of a building where snakes are likely to travel. Rodent control glue boards are often effective for catching snakes that have taken up residence inside a building. The glue board is coated with a sticky substance on one side; this causes the snake to become stuck as it attempts to cross the board. 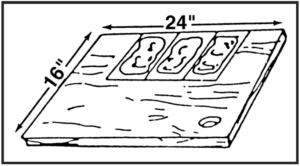 Several rodent glue traps can be attached to a plywood board approximately 24 inches by 16 inches (Fig. 3). The trap should then be placed near the wall where snakes travel. Captured snakes can be released by pouring vegetable oil over the snake and glue board. Glue boards are available at feed stores, hardware stores and/or grocery stores. Funnel traps also can be effective in capturing snakes (Fig. 4). A funnel trap can be constructed by rolling a 3-foot by 4-foot piece of 1/4-inch hardware cloth into a cylinder about 1 foot in diameter and 4 feet long. An entrance funnel is made in a similar way and fitted into one end of the cylinder. The other end of the cylinder is closed with hardware cloth. The trap can then be placed next to a fence or building where snakes are likely to crawl. Fig. 4. A funnel trap can be placed by the side of a build- ing or existing fence. Construct a small “drift fence” from 1 / 4-inch or 1/2-inch hardware cloth 2 feet high. The funnel trap can then be placed where the two fences come together. There are currently no toxicants or fumigants registered for the control of snakes. Registered commercial repellents are available for some species of snakes and should be used according to the label. It is sometimes possible to remove snakes from a house or other building by placing piles of damp burlap bags in areas where the snakes have been seen or are likely to be. Snakes are attracted to damp, cool, dark places such as the burlap bags. The bags should be checked every few days for captured snakes. All snakes in Indiana are protected by state law. Non-endangered species of snakes can be captured and killed by a landowner or tenant but no more than 4 of a species can be taken. A fishing or hunting license is required to collect or kill non-endangered species of snakes, except on land that you own or lease. 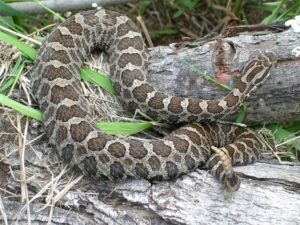 Individuals with nuisance wild animal control permits from the Indiana Department of Natural Resources can also assist individuals with removing snakes. Timber rattlesnakes, Massasaugus and cottonmouths are endangered species in Indiana and can only be taken with a special permit from the Indiana Department of Natural Resources, unless the snake is an immediate threat to a person’s life or property. Before using any snake control measures or moving captured snakes to another area, please contact the Wildlife Conflicts Information Hotline at 1-877-463-6367.